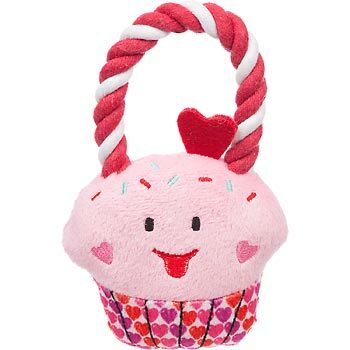 This Valentine cupcake plush and rope dog toy is the perfect Valentine’s Day present for a little dog! It’s only $3.99 on the Petco website and if your dog loves playing Tug-o-war like mine does I’m sure he or she will be happy with this toy! Growing up I remember my siblings and I always played with the same monopoly movers, for some reason I was the thimble. 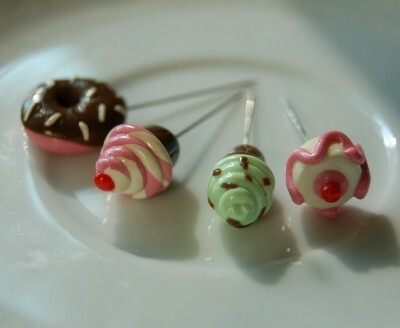 Now that I’m older Hasbro has made my cupcake loving dreams come true! 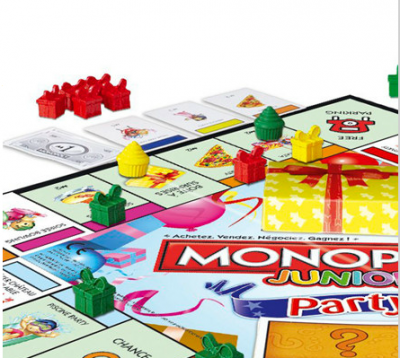 Monopoly Junior Party has crazy cupcake movers! If you look at the picture above you can see the green and yellow cupcakes that are used to move around the board. The games only $10.99 and there are four different colored cupcake movers! 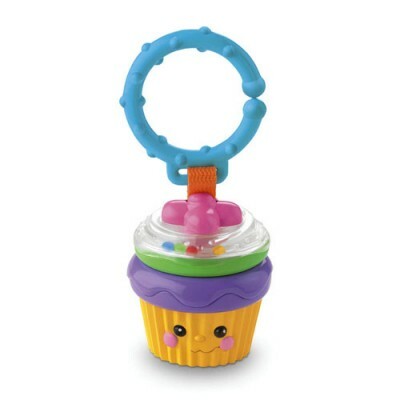 Last week at Target I noticed this cute baby cupcake rattle by Fisher Price Toys. 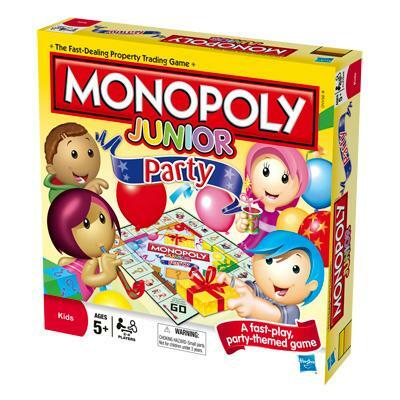 It’s available on the Fisher Price website for $5.00 or $4.84 in Target stores. 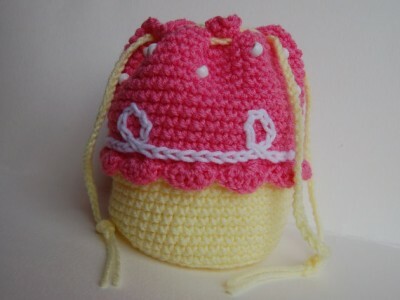 I wish I needed a baby gift and I could give a baby it’s first cupcake! 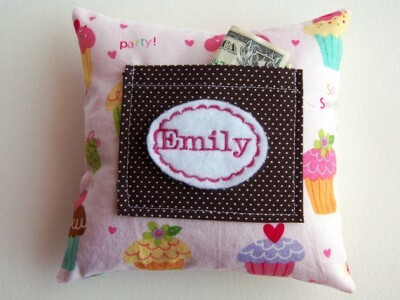 Romp is a great website for children’s toys, accessories, and room decor. 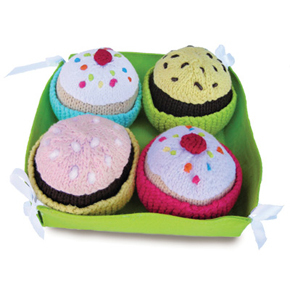 They have a set of four plush cupcakes for $36.00 that are prefect for toy kitchens. 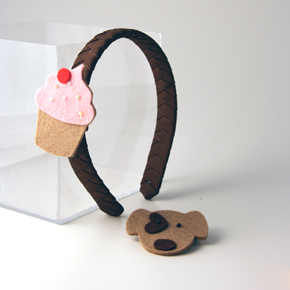 There is also an it’s a snap headband that comes with two snaps, a cupcake and a puppy for $20.00. 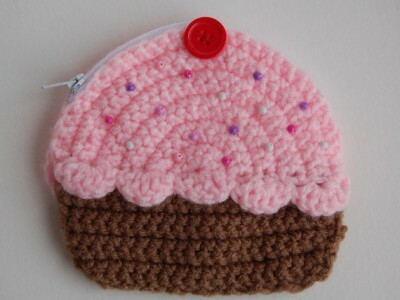 Have you seen these Yummy plush cupcakes? 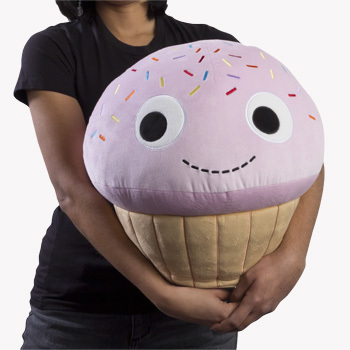 I have no idea what I would do with a 15 inch plush cupcake that costs $75.00 but the smiling face makes me want one! 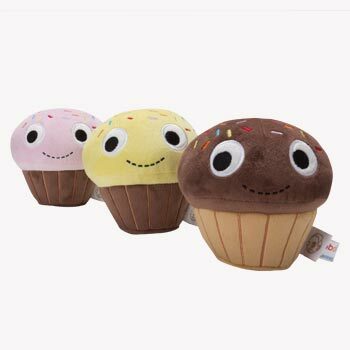 There are also mini 4.5 inch plush cupcakes that come in three different colors and are much more affordable at only $15.95 but the larger cupcake is much more fun! I remember the Legos I grew up with were the basic primary colors and we mostly built towers and cars. 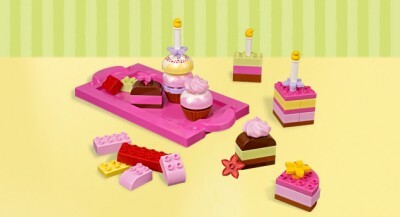 The Legos I had definitely were not as exciting as this creative cakes set that is available for $24.99. I love that this set gets girls more involved in playing with Legos, allowing them to make cakes or cupcakes and the lid doubles as a serving tray!